St Kilda is the most remote of the Western Isles of Scotland, one of the most inaccessible parts of the UK, the archipelago separated from the nearest island by almost fifty miles of famously turbulent ocean. It’s an ancient landscape, whose isolation bred a particularly hardy band of islanders, whose connection to the mainland was tenuous at best. For much of the 19th century, the only contact was the annual visit of the Factor, collecting rents for the estate which owned the island, and the occasional naval vessel, delivering charity or supplies. In the latter part of the century, the emergence of steamships provided for the start of occasional tourism, itself a new concept at scale. Conversations, where they happened, between island and mainland, would take, at best, weeks, at worst, years. Letters handed over to captains, messages passed on second and third hand. The Post Office ducked it’s responsibility to provide a service for over a century. But this did not prevent a mail service from emerging. The idea for the St Kilda Mailboats appears to have been born from a journalist, John Sands, whose writing about the islanders was far from kind, characterising them as primitives, but whose hospitality he was forced to endure on a protracted stay in 1876. Whilst the ocean is an unkind mistress, he reasoned, she does nonetheless provide some predictable currents: a small boat, with suitable buoyancy and sail area, will be carried by the prevailing tides and breezes, to the shore. 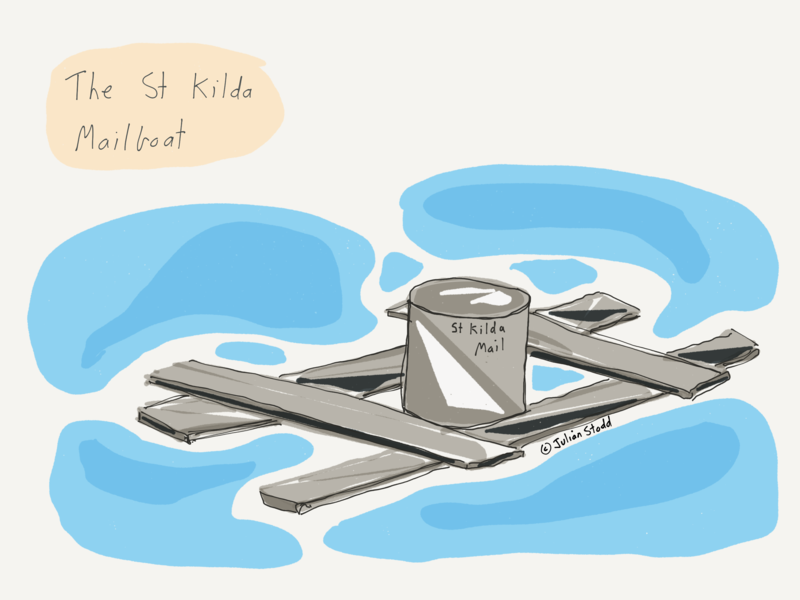 And so emerged, as he cast something the size of a toy boat into the sea, the St Kilda Mailboat. The Mailboats were many and varied: they included a waterproof container, a tin, or leather pouch, some kind of buoyant structure, either wood, or an inflated sheeps bladder, and the mail itself, with a few coins. The idea was that these washed up on remote beaches, which were frequently scoured by officials searching for wrecks, who would find the Mailboat, take the letter, and post it onwards. Haphazard, maybe, but surprisingly effective. You could always increase the odds by casting four or five into the surf and hoping that at least one would land. The subject of the letters ranged from requests for medical help, through to complaints to the landlord. The Mailboats remained as a phenomena rich through until the Islands were evacuated and abandoned in 1930, the final act of an Islander being to cast a boat into the sea, which washed up in Norway three months later. Today, the notion of a Mailboat is anachronistic: when we communicate, we do so with a relative amount of certainty, in the location of delivery, and in the mechanism of transport, be it physical or digital. One of the first things to say to someone is ‘what is your email address’, because to ‘know’ someone is to ‘know’ how to contact them. The technology of the Social Age is connective, at scale, and both robust and resilient in it’s breadth. But part of our self congratulation may be hollow: within formal Organisations, we rely on ‘communication’ teams, who provide a guarantee of quality and reach, but whose effects may be rather more like the ocean tides than we would care to admit. Sometimes the message washes straight through to the correct beach. And sometimes it ends up in Norway. Often, it sinks without trace. The formal Organisation, the one that we can see and, to some extent, control, is but one facet of a multi dimensional entity. An entity that is governed by a strong ebb and flow of tides, and frequent storms. Sometimes the most rudimentary approaches may outwit the most innovative. Sometimes we are just at the whim of the currents. The Islands understood this: message sent does not equate to message received. And to delude ourselves to the contrary is false hope. Our best bet is to learn to read the currents, be creative and diverse in our Mailboat design, and sometime to remember that we have to throw a few letters into the surf before one floats in the right direction. This entry was posted in Communication and tagged Communication, Islands, Stories, storytelling. Bookmark the permalink.